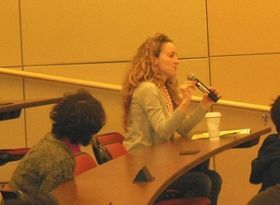 (Minghui.org) Free China: The Courage to Believe was screened on the campus of Carnegie Mellon University on March 29. The movie examines the human rights violations in China through the stories of two Falun Gong practitioners who were imprisoned, tortured, and forced to do hard labor for their spiritual belief. The truth about organ harvesting depicted in the movie shocked the audience, including several visiting Chinese. Afterwards, the audience discussed the restriction of information and organ harvesting in China. Jessi Cisewski, a visiting professor in the department of statistics, asked if there was a website that listed the companies that import products from Chinese forced labor camps. She said that she had seen Falun Gong practitioners'' activities in London. The peaceful vibe attracted her, and she developed an interest in Falun Gong. She said that the movie Free China gives the audience a broad picture of the persecution in China. “It is very important. I''d never heard about this. I am truly horrified,” she said. 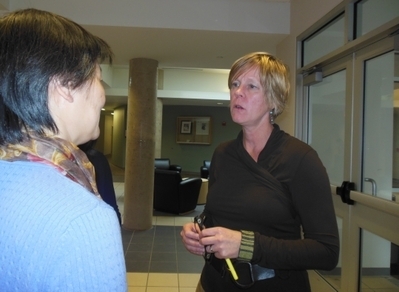 Lisa Krieg, the director of Enrollment Service at Carnegie Mellon, said that the movie was very moving and offered a disturbing perspective on modern China. Ms. Krieg was in China in the 1980s. Later she lived in Taiwan for three years, where she learned about the Tiananmen Square massacre and other true stories of China. She believes that the traditional Chinese culture is well protected in Taiwan. She had heard about Falun Gong. She said that the persecution of Falun Gong is a tragedy and a disgrace. "It is hard to imagine that people in China cannot express themselves even in a peaceful way. The movie also reminds Americans that we are lucky to have all kinds of freedoms."